Like a lot of good things in life, it all started with a motorcycle. An obsession with motorcycles and motorcycle gear morphed into the launch of Joe Rocket in 1994, manufacturing quality motorcycle jackets. Joe Rocket's "Phoenix" nylon jacket sold a hundred thousand pieces because the perforated, fully armored jacket was the first to provide serious hot weather protection and keep the rider cool. Then after sponsoring 17-year-old Nicky Hayden, Joe Rocket became etched in motorcycle racing culture. Joe Rocket went on to expand its motorcycle gear to include helmets, pants, luggage, boots, and gloves - all designed ahead of the curve of protective motorcycle apparel. 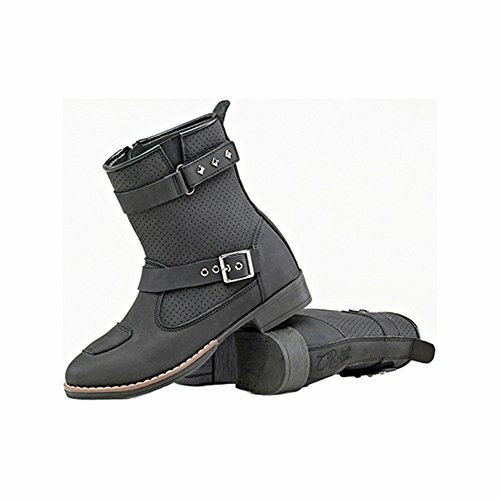 LADIES MOTO ADIRA BOOT. Premium, full-grain, matte finish leather construction. Perforated leather comfort top. Double over stitching in all key stress areas. Full-length YKK side zipper entry. Integrated stretch gusset. Upper adjustment strap. Lower buckle (decorative). Leather reinforced shifter zone. Non-slip sole design. Removable insole. Subtle embroidered branding.